When it comes to knitting needles there is so much choice around these days, it’s not like it used to be with a one type fits all approach with steel needles and we didn’t know any different. Nowadays, the choice is endless, we have bamboo, birch, oak, rosewood, brass, aluminium, carbon, ebony, slate, blonde wood, acrylic and probably many more….! The choices don’t end with what the needles are made from, you then have to decide whether you want straights or the increasingly popular interchangeables to make circular needles and if you do want straights, what length do you want? And ‘then’ you ask yourself, do I need any more knitting needles when I inherited a bag full from Great Aunt Lilly!!! Different yarns behave very differently and if you have a choice of needles you can often make knitting a particular yarn much more pleasureable and a heck of a lot easier by having the right needles for the job. For example, cotton is notorious for being horrible to knit with, it splits, it drags and it always comes out bigger than tension. If you were to knit cotton yarn on an oak needle for example, you have a fairly ‘dry’ wood and a very dry yarn, the yarn will drag and split and it will be very slow and tedious. Change the needles to a KnitPro Nova Metal which is a hollow brass nickel plated tube, (the hollow brass keeps it light and the nickel gives it a tremendous slick finish), knitting with cotton is a whole new ball game, the yarn slips quickly away with no drag and the splitting is barely noticeable! The flip side of this being that if you have a very smooth and slippery yarn such as silk, you might have a bit of a job keeping your stitches on the Nova Metals, they are just ‘too’ slippery, at the other end of the spectrum the oak is too dry – a fine fibre like silk demands a very smooth needle otherwise you risk damaging the fibres and developing a halo……you would therefore be better choosing a laminated needle like the KnitPro Symfonie, a laminated birch, they are stained in rainbow colours so are fun as well as beautiful to knit with. All the KnitPro range have very good precision tips, not so pointy you injure yourself but pointy enough to get into the stitches quickly and efficiently. The KnitPro Symfonie range does score a lot of points in my book as it is generally a very good ‘all rounder’, there are very few yarns that fair better on anything else, in fact, there is probably only cotton and cotton based yarns that work better on the Nova Metal! 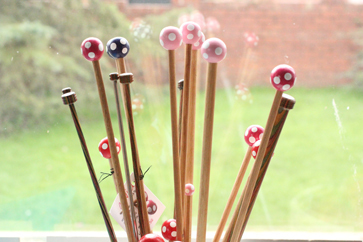 ArtViva are a very popular needle, they are hand made from Tasmanian Oak, in Tasmania, they have really cute polka dot painted tops in pinks, reds, purples greens and more, the size range is slightly limited on the finer ones being that they start at 3.75mm and they only come in shorter lengths for the smaller sizes although the chunkier ones you can get in a 35cm length and they go up to 12mm. They look fantastic poking out of your knitting bag! I found the ArtViva a little ‘draggy’, I wouldn’t recommend them for fine fibres such as silk or silk mixes as the drag will make knitting tedious and could damage the fibres but on a strong woollen based yarn, they are fabulous, they are light weight but feel strong and you can get up some good speed with the right yarn. They also make great needles for children and beginners, when you are learning to knit, the last thing you want is your stitches flying off so the drag on the ArtViva is a very welcome one! Rosewood, bamboo and the other ‘woods’, behave very similar to the KnitPro Symfonie, smooth and universal with just enough slip to knit quickly with but not too much slip to lose your stitches. The main disadvantage with bamboo, although it is much less expensive than the others is that the tips are quite ’round’ and ‘dull’ and they do tend to warp quite quickly. Acrylic needles are not my favourite, they do have quite a bit of drag but it’s more of a squeaky drag and if you try to knit an acrylic based yarn on acrylic needles you will most likely have a ‘squeak’ going on, especially if you have a tendency to knit tight. They are also fairly brittle and so tight knitters beware, there is not much give and too much pressure will have that fearful ‘crack’. Having said that, they are a cheaper option than the Nova Metal or Symfonie wood, they are available in both straight and interchangeable (although straights don’t start until 5mm) and they are great for children and beginners because the drag helps control unruly stitches from flying off! I haven’t tried slate or carbon but I’ll let you know when I do! It has also been said by many that people with arthritis should use bamboo knitting needles, this all came about with the introduction of bamboo needles in the mid 1980’s and people generally found that they could knit for longer with less pain with bamboo, and it is true, it’s not a myth, bamboo is definitely better for your hands than the old metal needles. But, since the introduction of the light weight hollow brass Nova Metal, the laminated birch Symfonie and Lantern Moon Rosewood needles, your options are now much broader, you can still have the lighter needles which are kinder on your hands but you can have the precision tips which make getting into the stitch easier too! The next question is length, straight needles come in lengths from 20cm to 40cm. To an extent, it depends on your knitting style, if you like a needle tucked under your arm, you will need something around 35cm, if you sit in an arm chair with high arms and knit on your knee, you’ll be better with 25cm or 30cm so you don’t keep bashing the chair arms. I don’t seem to sell many 40cm needles, personally, I find them a bit long, I knit with my right hand needle over my arm and with 40cm I feel like I’ve got wings. 35cm works best for me, it sits over my arm without falling off and is long enough to hold enough stitches for a sweater. I can, when I need to, knit on my knee which then means 35cm is way too long, I end up poking everyone and everything around me so I choose a 25cm needle instead. Obviously, long straight needles are difficult to travel with, they are not so convenient to tuck away in your bag to take to work incase you get chance to do a few rows in your lunch break and this is where Interchangeables have come into their own over the last few years in the knitting revival. There are now literally thousands of people who have come out of the knitting closet and knit on the train, knit in the doctors waiting room and will take their knitting everywhere so there is never a knitting minute lost. These are the people who love interchangeables. Intechangeables are in principle, circular needles but you can screw off the tips (the needle part), leaving the cable (with your stitches on) and change the tips or put end caps on to stop your stitches coming off if you decide to hide the project away for a while or when travelling. Interchangeables come in the same choices of material as do straights and the same rules apply, both laminated birch, rosewood and bamboo are pretty good all rounders and Nova Metal are great for cotton. I’ve not come across any oak ones, that’s not to say they don’t do them but acrylic make a pretty good alternative to oak for children and beginners as they similarly have quite a bit of drag – as mentioned earlier, the only disadvantage to acrylic is they are fairly brittle and won’t cope with too much pressure if your tension is too tight. With interchangeables, you also get to choose from a variety of lengths of cable from 60cm, ideal for a hat that you want to knit in the round, to 200cm, great for a throw knitted as if using straights. You can also get cable connectors to join cables to custom make your own length. The main thing to remember is that you don’t need to knit in the round with circular or interchangeable needles. For years I never gave them a second glance as I had the blinkers on saying to myself ‘I don’t knit in the round’, until I made the discovery on a knitting workshop when I saw someone using them to knit a sweater, using them as straights….needless to say, I got home, tried it and presto, using circular needles for anything that I want to have as an ‘on the go’ project has now become common place. Sizing is another great mystery………old needles were sized as 7’s or 8’s for example, it was widely known that a DK yarn would knit on 10’s and 8’s and if you have a bag of old needles, it is likely that they will be in old sizes. It was around the mid 1980’s that needles started to appear in the new sizes in mm. It does cause a lot of confusion for some who haven’t knitted in a while who then pick up a modern pattern and yarn, then go to their stash of needles, the pattern may ask for a 4mm, you will see a size 4 and away you go. The problem is, 4mm is actually an old size 8, using an old size 4 will give you a massive difference on tension, the knitted fabric will be loose and the garment way too big. To confuse things even more, there are a lot of US patterns becoming increasingly popular, especially with the availability on the internet. US needles are sized different again! Hopefully, the chart at the bottom will help! Having read this post, I hope you are a little clearer on what may be the best needle choice for you. I too have a great stash of inherited needles, I just keep them as a memory and keepsake. They are not good to knit with, there’s so many odd needles with different points, different lengths and some are bent. They will do the job, but they won’t give me an ounce of the pleasure I will get from ‘my own’. All of the needles mentioned in this post are available from Little Houndales Knits, not all are kept in stock but can be ordered at competitive prices to arrive within just a few days. Just to add that as one of many knitters with health problems, using interchangeable needles allows me to hold the weight of the knitting on my lap and avoid the shoulder or neck pain which has hampered my crafting in the past. Although I also really love the artviva needles, due to being a little bit accident prone, I now have a couple of very posh DPNs and 2 adorable shawl pins…. What an interesting and informative answer to my knitting problem. Thank you. Thank you! Very helpful post. I too assumed interchangable needles would only be good for in-the-round projects, but after reading your post, I can’t wait to give them a go.